Cook linguine to desired doneness as directed on package. Drain; cover to keep warm. Meanwhile, in small bowl, combine curry powder and salt; mix well. Place chicken strips in medium bowl. Sprinkle with curry mixture; toss to coat. Set aside. Heat oil in large skillet over medium heat until hot. Add onions; cook 3 to 4 minutes or until softened, stirring frequently. Add garlic; stir to combine. Add chicken; cook 5 to 7 minutes or until chicken is no longer pink in center. Remove chicken mixture from skillet; place on plate. In same skillet, combine coconut milk, lime juice, brown sugar, soy sauce and pepper flakes; mix well. Bring just to a boil. Stir in peanut butter until well blended. Increase heat to high; cook 6 to 8 minutes or until thickened, stirring constantly. Add chicken mixture; cook 1 to 2 minutes or until thoroughly heated. To serve, arrange cooked linguine on serving platter. Top with chicken mixture. Sprinkle with cilantro. Saté is a popular snack in Indonesia. The preparation consists of cubes of strips of meat cooked on skewers and served with spicy peanut sauce. 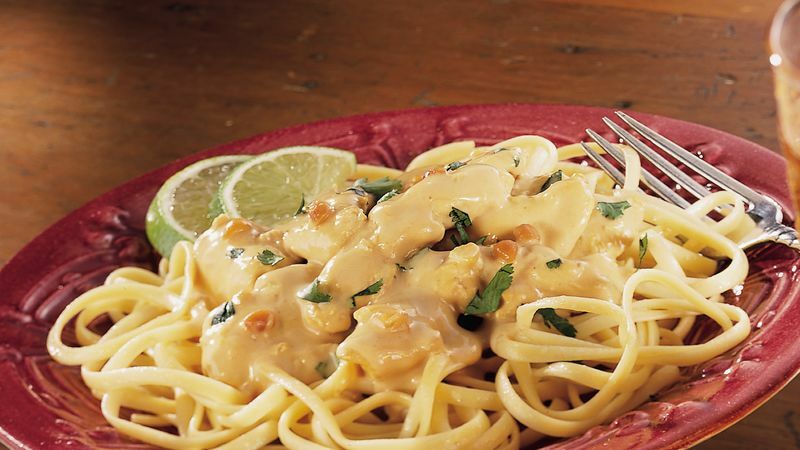 This chicken and pasta contains traditional saté flavors. Try fish sauce in place of the soy sauce in this recipe. Made from fermented salted fish, fish sauce is the primary seasoning throughout Asia. Look for it at an Asian market or near the Asian foods at the grocery store. Serve this dish with a refreshing cucumber-mint salad.